In a world of FireFox and its beautiful extensions of web-development power, Internet Explorer has been a horrid browser to develop/debug your code. This toolbar isn’t a match for the features, look, or usability of FireBug…but it is a great start and a pretty decent tool provided by the guys at Microsoft. As many developers can attest, developing sites that work according to standards AND Internet Explorer is a pain…this tool eases that pain. 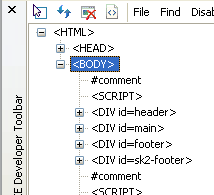 Oh, and once you install the toolbar, it is hard to see where to open the thing. After installing, a little blue arror will appear in the icon bar at the top of the browser. Click that and the tool will open at the bottom of the screen.